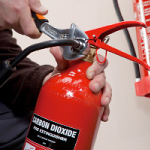 This fire extinguisher technicians full course is ideal for anyone wishing to undertake (and become a ‘competent person’ in) the election and installation, and commissioning and maintenance of portable fire extinguishers. This course fulfils the training competency requirements for registration on third party certification schemes i.e. BAFE SP101, leading to demonstrable competence under the Regulatory Reform (Fire Safety) Order 2005.